Providing professional and innovative drilling services and equipment for four generations to New Zealand and the Pacific Islands. The leaders in Water Wells, Mineral Exploration, Geotechnical, Environmental, and Geothermal drilling. 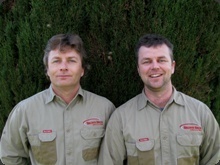 Brothers Kelly and Nathan have recently taken over ownership of Brown Bros Drilling, from Graeme Brown, continuing a long tradition of drilling in the Brown family – 4th Generation drillers. Kelly and Nathan will continue the tradition of great personal service and helpful drilling advice to ensure your project gets done. We wish to thank all our existing customers for your continued support. Both Kelly and Nathan have worked their way up from the drill rig floor and are conversant in all major drilling methods. Kelly specialises in Water Wells and Mineral Exploration, while Nathan concentrates on Geotechnical, Environmental, and Horizontal drilling. If we are in your area this week we can share the costs! Website Design by Enlighten Designs. Copyright © Brown Bros Drilling.